The recommendation for this very good book came to me via the ever-reliable Mrs Peabody Investigates and the best review I could write would be “ditto”. But we all know I’m going to be more wordy than that. 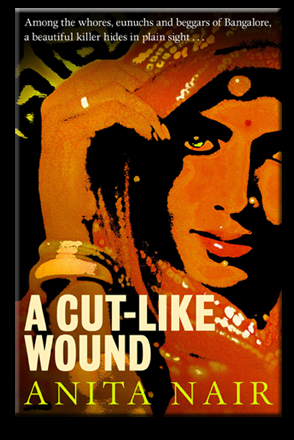 If you are the sort of reader who likes to travel vicariously through story then A CUT-LIKE WOUND is for you. Set in present-day Bangalore the book almost literally transported me across the globe. You really do get a sense of the place…the heat, the crowds, the fascinating social mix, the sometimes odd mixture of old and new. At times I was amazed at how different the world depicted is from my own then a few pages later I would be chuckling at the similarities (it seems working in government is much the same wherever you go) but I loved it all. I also liked all the ideas and subjects the novel explores. A major component of the story is the treatment of the hijra community (transgender people and eunuchs) within Indian society and not in a token way to give the gook an exotic flavour. The subject is looked at from several perspectives and never strayed into dogmatic territory but always fascinated. In addition the novel touches on gender politics, the role of petty corruption and, though in a minor way, the impact of immigration into India. Gowda saw the glitter of excitement in the young man’s eyes, the fervour to do good in his stance and gait, the smooth, shaven cheeks and the precision of his movements. The innocence of the uncorrupted mind; the naivety of youth. Gowda felt a pang of regret. Once, Gowda had been that young man, seeking to protect the weak and needy, aching to scourge the world of its evils. Where had it all gone? The juxtaposition of the two perspectives carries right through the novel and is something of a highlight. The investigation struggles for a variety of reasons including jurisdictional competition and a lack of interest in the type of victims being affected. At times comparisons are made to western (i.e. American) style investigations but these are not always in the west’s favour. Where the book does fall down a little is in its resolution, particularly the reasoning provided for the string of truly horrendous crimes. It really didn’t seem plausible to me. A CUT-LIKE WOUND offers many of my favourite things about modern crime fiction: an evocative setting, a wry sense of humour and an exploration of intriguing aspects of our modern world. The fact that neither the crimes themselves nor the ultimate reason for their occurrence are completely credible seems almost irrelevant. This entry was posted in Anita Nair, book review, India. Bookmark the permalink. This one does sound absorbing, Bernadette. I know just what you mean about being transported to a different place, and I respect an author who can do that. And the issues Nair addresses are engaging, too. I’ve had this one on my radar, and it’s good to know I’ve a good read in store for me. I’ve had this book on my TBR list, too. I will look for it. Glad you liked it and wrote a thorough review. Thanks for the kind mention, Bernadette, and I’m glad to hear you liked the novel – great review. I love the way that international crime fiction can open up other countries and cultures to us. I’ve just had an intriguing crime novel from the Faroe Islands arrive in the post: Jogvan Isaksen’s Walpurgis Tide. Looking forward to that one as a definite first! This does sound very good, different. I had not heard of it before. If I did not have a book buying embargo on through the end of March, I would go buy it right now. I will put it on a list and look for it later. I am pleasantly surprised at the fact that my library actually has this book — one copy and I’m the only one reserving it. But a note that Bitter Lemon Press has several interesting books, and fortunately, my library has the ones I want to read. Now how often does this happen? Yes, do all you can to avoid JP. I see that his new book is no. one on the New York Times hard-cover best-seller list. Oy. I also enjoy learning about various countries and cultures via crime fiction. You’ve done it again. I’ll have to read this book. Thanks.